Explanation: Sometimes, regions of planet Earth light up with fire. Since fire is the rapid acquisition of oxygen, and since oxygen is a key indicator of life, fire on any planet would be an indicator of life on that planet. Most of the Earth's land has been scorched by fire at some time in the past. Although causing many a tragedy, for many places on Earth fire is considered part of a natural ecosystem cycle. Large forest fires on Earth are usually caused either by humans or lightning and can be visible from orbit. 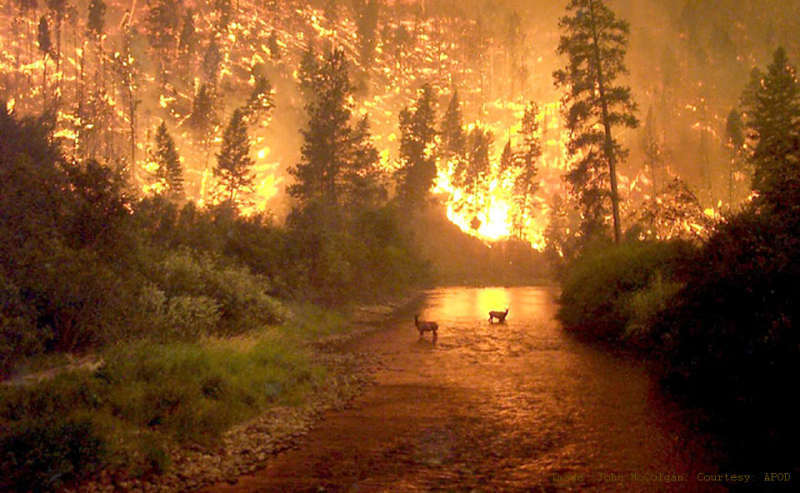 Featured from the year 2000, stunned elk avoid a fire sweeping through Montana's Bitterroot Valley by standing in a river.